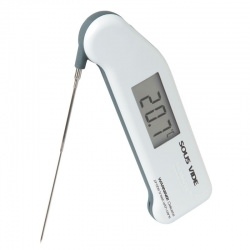 The temperature of food is very dynamic, particularly while it is cooking, and the Super-Fast Thermapen is fast and accurate enough to show minute changes in the temperature while they occur. The tip of the Thermapen probe can be pushed through food helping you find the coolest part of the center and can show differences in temperature from one spot to another (different parts of a whole Turkey can differ by as much as 11°C). 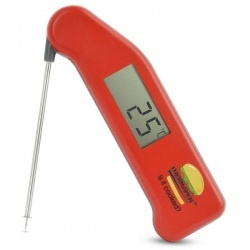 While it can take 2 or 3 seconds for the Thermapen to move from the ambient temperature (room temperature) to the temperature of a food or liquid, once its micro-thermocouple has honed in on the current temperature, it is very quick to sense and display changes (the display refreshes every half-second). Of course, these minor changes can be hidden by changing the display resolution of the Thermapen from tenths to whole numbers (see Customising your Thermapen). Whole numbers can be very comforting. 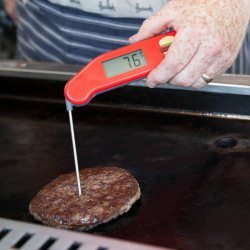 Sometimes people have a mentality that cooking thermometers should be like bathroom scales or speed guns and lock in on the temperature once it is detected, but rest assured, if the Thermapen numbers are changing, the food’s temperature is changing!